Lysosomes are a key component in the effective function of human cells. Small and often overlooked, lysosomes work as part of the recycling system of the cell. 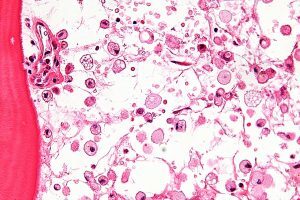 In this article, we will look at the structure, synthesis and function of lysosomes, and their role in some pathologies. 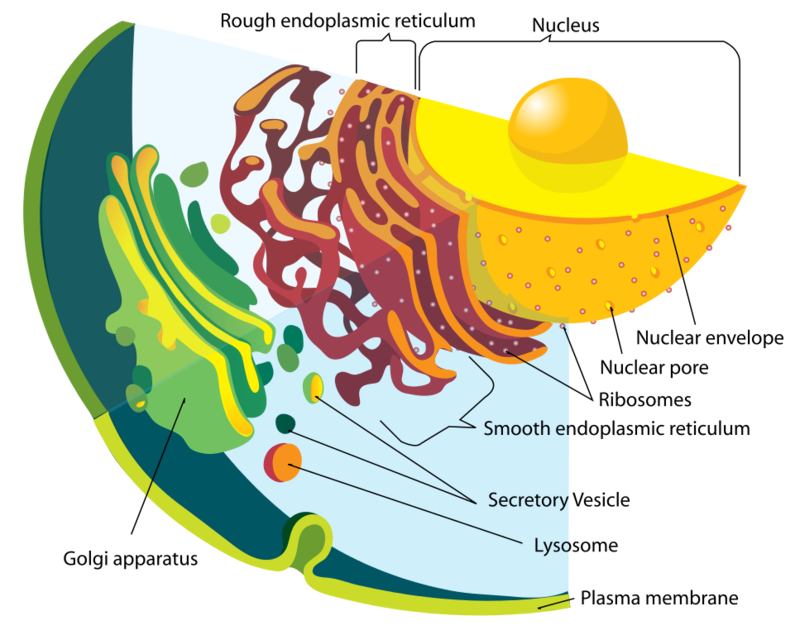 Lysosomes are membrane-bound organelles found within cells, usually around 1 micrometre in length. Their primary function is intracellular digestion. Lysosomes contain numerous hydrolytic enzymes which catalyse hydrolysis reactions. The membrane surrounding the lysosome is vital to ensure these enzymes do not leak out into the cytoplasm and damage the cell from within. Lysosomal proteins are formed in the same way as any other protein. The first step is initiating mRNA strand production from the relevant sections of DNA. From these, the hydrolytic enzymes can be built up. The mRNA strands proceed to the rough endoplasmic reticulum, where ribosomes can continue to construct the functioning proteins. Importantly, these proteins are tagged with mannose-6-phosphate within the Golgi apparatus. This tag binds to mannose-6-phosphate receptors in the Golgi apparatus. As a result, vesicles containing these enzymes bud off from the Golgi apparatus. Two enzymes are responsible for the attachment of the mannose-6-phosphate tag: N-acetylglucosamine phosphotransferase and N-acetylglucosamine phosphoglycosidase. This vesicle, now in the cytoplasm, then binds with a late endosome. The late endosome has proton pumps within its membrane that keep its internal environment acidic. The low pH causes dissociation of the protein from the mannose-6-phosphate receptor. This receptor can then be recycled back to the Golgi apparatus. The phosphate group is also removed from the mannose-6-phosphate tag, to prevent the whole protein returning to the Golgi apparatus. The late endosome can eventually mature into a lysosome, after it has received the enzymes from the Golgi apparatus. Lysosomes play an important role in phagocytosis. 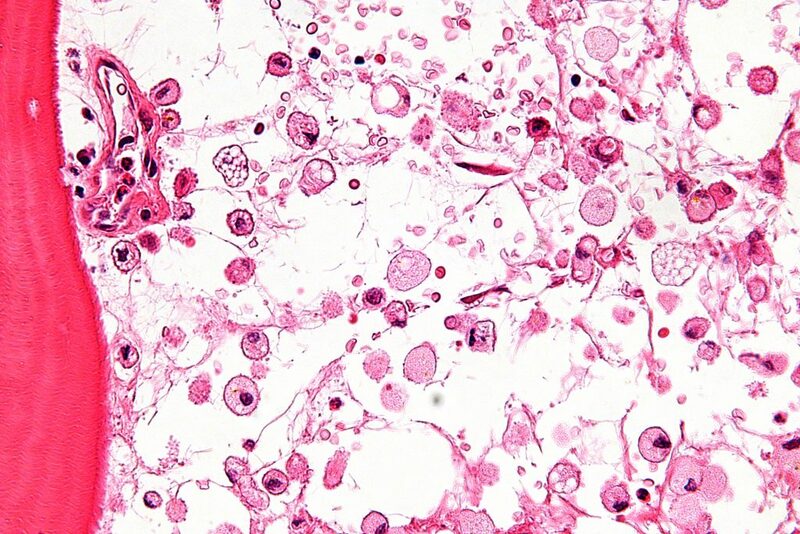 When macrophages phagocytose foreign particles, they contain them within a phagosome. The phagosome will then bind with a lysosome to form a phagolysosome. The hydrolytic enzymes contained within the lysosome allow foreign particles to be destroyed. These enzymes are critical in oxygen-independent killing mechanisms. Lysosomes also help to defend against pathogen entry via endocytosis by degrading pathogens before they reach the cytoplasm. This is caused by genetic defects in the N-acetylglucosamine phosphotransferase enzyme. This enzyme is vital for the addition of mannose-6-phosphate to lysosome-targeted proteins. This results in lysosomal enzymes not being properly targeted. As a result significant amounts are found in both the urine and the blood stream. These are a group of genetic conditions affecting lysosomes. The condition vary widely in signs, symptoms and patient demographics. There are several classifications; the most common of these conditions is Gaucher’s disease. It is caused by a deficiency of the beta-glucocerebrosidase. This enzyme is required to break down glucocerebroside. Without this enzyme, the glucocerebroside is able to accumulate within cells, which can damaging them. Symptoms include hepatosplenomegaly and anaemia. What is the primary function of lysosomes? Which molecule is important to tag lysosomal proteins? Which feature causes dissociation of M-6-P from its receptor? Lysosomes play an important role in which process?